HeadSavers are available in two sizes which are fully Velcro adjustable to fit most people. When placed on the head Headsaver offers an extremely comfortable fit that holds the HeadSaver in place so that during a fall the HeadSaver should not come off the head. If additional securing to the wearers head is required a Velcro detachable chin strap with clip is provided with every HeadSaver. There are 3 coverings available to dress up HeadSaver in style- the classic toque, the practical sun hat, and the very stylish headscarf. 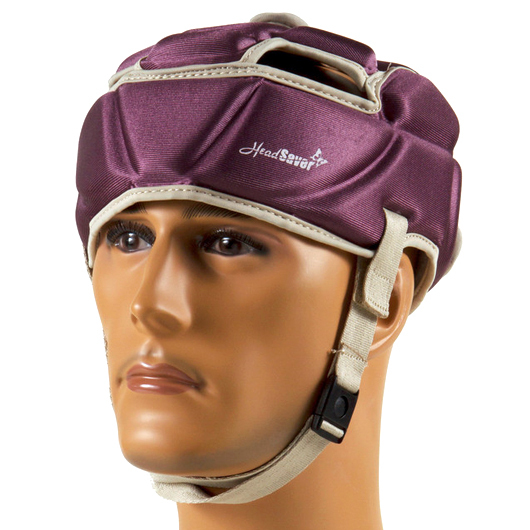 HeadSaver - the only stylish soft head protector that's scientifically validated! HeadSaver soft head protector can be gently hand washed with warm water and mild detergent and air dried away from sunlight. It should not be tumble dried or dried on hot radiators. Do not dry clean. Do not bleach.